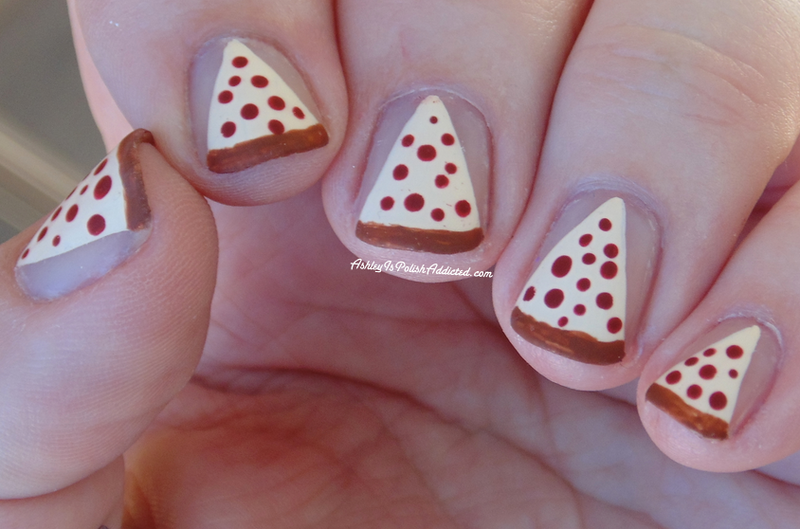 Ashley is PolishAddicted: The Digit-al Dozen Does Food: Day 2 - Pizza Date! 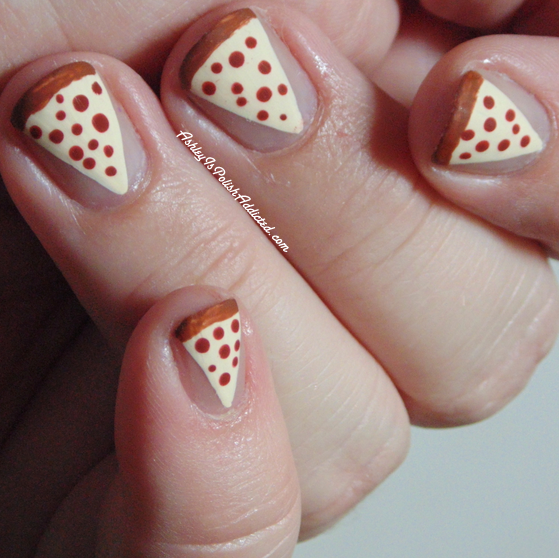 Jacki from Adventures in Acetone, Laurie from Dressed-Up Digits, Sheila from Pointless Cafe and Victoria from Vic and Her Nails (as well as myself, obviously) are all having a pizza date today. I love pizza and I love these ladies, so it seems like a win/win to me! I don't usually do negative space manis on myself for a couple of reasons. One, while I love how they look on other people, I don't normally care for them on myself. Two, my nails are very stained so I usually try to keep them covered. But I thought the pizza slices would look cool with negative space around them so I solved the staining issue by doing the slices upside down (since my tips are more stained than the rest of my nail) and I put down a base of Girly Bits Smooth Move (ridge filling base coat) that I recently purchased from Lulu's Favorite Things at Elevation Polish. I love how Smooth Move tinted my nails just slightly so it looked like my natural nail, but much better! It also smoothed out the ridges I had and made the finished look so nice. It gets two polished thumbs up from me! I created the pizza slices using acrylic paints. I then topped the mani with a coat of top coat and a coat of Girly Bits Polish Matte'rs, which is probably the best and most matte matte top coat I've used. I got this while I was in Las Vegas for CosmoProf and I'm so glad I did because I had been on the hunt for a really good matte top coat! I definitely like it well enough to repurchase when I've used this bottle. 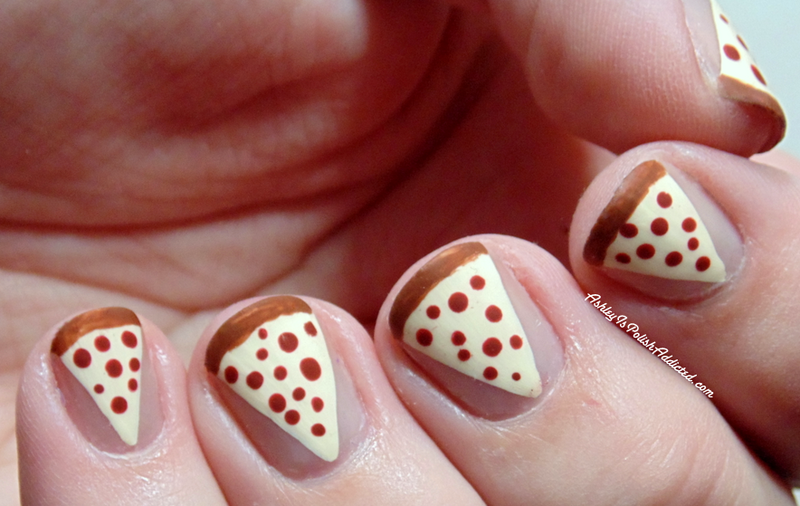 I usually dislike negative space manis for the same reason, but these are so freaking cute! Pizza pizza! I love that you just did the pizza and left the background naked!